The first "L" station at Ridgeland Avenue was built as part of the Lake Street Elevated's 1901 street-level extension along South Boulevard to Wisconsin (Marion) Avenue in Oak Park. The "L" was powered by overhead trolley wire along the extension for safety purposes due to the grade-level running. The tracks also paralleled the adjacent Chicago & North Western Railroad. The modest stations on this portion consisted of island stations and platforms constructed of wood. The narrow station houses with their clapboard paneling and peaked roofs with overhanging eaves emptied out onto an island platform covered by a peaked canopy that was actually a continuation of the station house's roof. The tall steel poles that carried the "L"'s overhead wires occasionally poked through the canopy, interrupting the platform. The "L"'s street-level operation began to result a number of crossing accidents, typically due to pedestrians and wagon drivers failing to take note of approaching trains. Neither the "L" nor the C&NW had any type of crossing protection originally. Manually-operated crossing gates and gatemen helped reduce accidents but did not eliminate them. The problem got worse as automobile traffic entered the picture and became more prevalent. The situation was further exacerbated when the parallel C&NW elevated their right-of-way circa 1908-09, creating a blind intersection due to the embankment preventing southbound traffic from seeing approaching "L" trains until they were on the crossing. The Chicago and Oak Park municipal governments tried for decades to get the "L" to elevated their tracks west of Laramie Avenue, to no avail. Finally, in 1961 construction began on a joint project to elevate the Lake Street "L" tracks. The $4 million project was jointed financed by the Chicago Transit Authority (who had assumed operation of the "L" in 1947), City of Chicago, Village of Oak Park, Cook County, State of Illinois, and US Bureau of Public Roads, and in cooperation with the Chicago & North Western Railroad. Rather than build a new elevated structure for the "L", the rapid transit tracks were relocated onto the C&NW's embankment, occupying the southern portion of the elevated right-of-way, which the railroad vacated. The elevation project eliminated 22 grade crossings between Laramie and Harlem avenues. Integrated with the south wall of the North Western embankment, the new stations incorporate many design features. Large picture windows enhance a light and bright interior. External walls are of ceramic glazed brick in the color code for the respective station. The color is repeated in porcelain enamel panels of each station front, in the glazed ceramic tile of the interior walls, and in the porcelain enamel panels of the agents' booths. Electric signs over the entrance of each station buildings are to identify the station and display the travel time between the station and Chicago's Loop. Passenger control facilities include agent-controlled, illuminated fare indicator turnstiles, coin-operated turnstiles, and electrically-operated, remotely-controlled exit turnstiles. In the metal platform canopies, which extend over the roofs of cars at train stops protecting boarding and alighting passengers from rain, sleet and snow, the station color code is repeated. Translucent fiberglass panels are interspersed with the metal panels of the canopies. Platforms and stations are illuminated by fluorescent luminaires. At the platforms, the lights are turned off ad on automatically by photo-electric cells. Lighting in the stations is controlled by the agents. 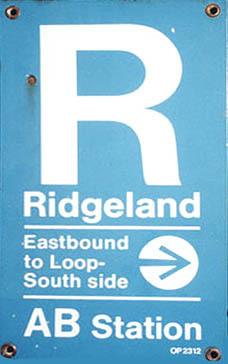 The "color code" for Ridgeland station, used for various accents in the facility, was light blue. The tiled wall outside the station entrance, on the embankment, featured pin-mounted metal letters spelling out the name of the station entrance. The platform features a wooden floor and a steel canopy supported by I-beams. The platform lights outside the canopy were unusual, found only in Oak Park suburban stations, with a thin pole and a conical head with a convex saucer as a cap. Lake "L" trains began using the new elevated right-of-way on the C&NW embankment between Laramie and Harlem on Sunday, October 28, 1962. The ground-level stations closed and the elevated platforms opened, but the new permanent street-level station houses were not ready yet, due to the street-level tracks needing to be removed before they could be completed. Thus, on opening day, temporary fare control areas were used at Ridgeland. Completion of the remaining amenities was not far off, however. The station's permanent station house went into service on Friday, December 28, 1962. The Lake Street "L" and the rest of the Green Line closed in 1994 for a two year refurbishment. 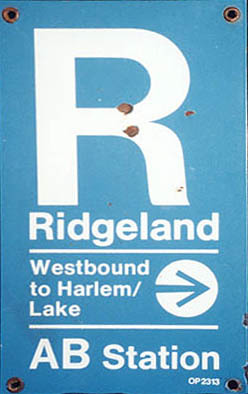 However, unlike other stations that were rebuilt, few alterations were made to Ridgeland station, as it was not originally budgeted to receive an overhaul. The existing station house, platform, and canopy remained. The station received new fare controls and some new signage, though some old signage remained. More significantly, Ridgeland station, along with Austin and Oak Park stations in Oak Park, reopened without modifications to make the stations handicapped-accessible. CTA officials contended they were not mandated by federal law to make all stations handicapped-accessible because they made only cosmetic changes to Oak Park and the two other suburban stations while carrying out the $350 million Green Line renovation. Eighteen of the line's 27 stations -- all stations except the three in Oak Park and some Loop stations shared with other routes -- were eventually made handicapped-accessible, including the Marion Street entrance to the Harlem/Lake terminal in downtown Oak Park. The other Oak Park stations, at Austin, Ridgeland and Oak Park, were not scheduled to be made accessible because the transit authority did not have the money, CTA Chairman Valerie Jarrett said in 1996. Oak Park residents with disabilities protested the lack of accessibility after the project, and Village President Lawrence Christmas agreed to seek funds to make all the Green Line stations in Oak Park handicapped-accessible but the three stations are still currently not ADA-compliant. Ridgeland station received some new signage at platform level in 2009, including new "board here" signs and new column signs that adhere to CTA's current signage standards (which, ironically, were first designed as part of the 1994-96 Green Line rehab), replacing some signs that dated from the 1980s A/B skip-stop era. The station name signs remain an odd variant, presumably installed in the 1994-96 rehab -- they have white letters on a green background, a style previously used for "B" stations in the skip-stop era (whereas Ridgeland was an "AB" all-stop station under A/B service).